Harold T. Enlow, Jr., D.M.D. Dr. Enlow graduated from The University of South Florida with an undergraduate degree in Natural Sciences. He continued his education at The University of Florida School of Dentistry and received his Doctorate of Medical Dentistry degree in 1985. He returned to practice in Tampa, his hometown. In addition to dentistry, Dr. Enlow has an intense love of music - please feel free to listen to some of his songs at www.myspace.com/halenlow. Dr. Enlow has released an original composition titled “The Amalgam Blues” on youtube.com. He also has a youtube video explaining some basics of Invisalign treatment - visit Tampa Dentist Invisalign. 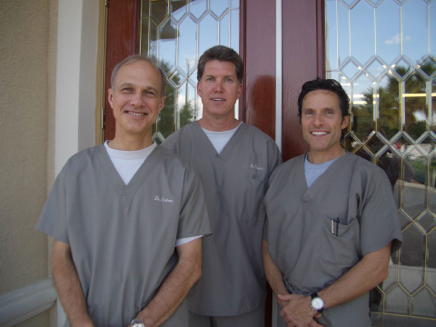 Dr. Vance completed his undergraduate degree at the University of South Florida in 1983. He earned his Doctorate of Dental Surgery in Cleveland, Ohio from the Case Western Reserve University School of Dentistry in 1988 and returned to practice in Tampa. Dr. Cullen received his undergraduate degree from Ohio’s Walsh University. He attended graduate school at the University of Akron and graduated from the Case Western Reserve University School of Dentistry in 1986 with his Doctorate of Dental Surgery. He received advanced training in the fields of implant and sedation dentistry at Loma Linda University in California and is a Diplomate in the American Board of Oral Implantology and a Fellow in the American Academy of Implant Dentistry.